Previously, I did a fishless cycle on this tank which took a grand total of one month. This time, I switched from the Powerbio 700 by Classica to a Elite Mini (a tiny internal filter which is quite efficient and was a favourite of mine for my fish room) which I “seeded” with cycled filter media from my display tank. I had also switched the heater from the 50 W heater that came with the tank to a Visitherm 50 W heater which was also salvaged from when I broke down by fish room five years ago. This puts the heater and the filter both at around 7-9 years old and still in perfect working order. To seed a new filter, some of the new filter media needs to be replaced with old, cycled filter media which already has all the necessary bacteria living on it. It is possible for a filter to be partially seeded, to kick start the cycle with household ammonia or for low stocking, or to be fully seeding so that it will be able to take closer to full stock immediately. If you are seeing your filter and aiming for higher stocking, I recommend that the seeding is followed by a fishless cycle, which should take no more than a week or so. I drip acclimatised the fish as normal and set up the filter at the same time on the 13th of December. Ammonia and nitrite have been at a constant 0 ppm since then, which means that seeding followed by immediate low stocking works well. Apistogramma commbrae are one of the rarer South American dwarf cichlids that are available in the hobby. You are unlikely to see these sold in a shop and only a handful of breeders keep these in UK. So unsurprisingly, there’s very little information available about the species. This beautiful cichlid comes from the Paraguay river system and it can also probably be found in southern Brazil and northern Argentina. For the “species spec”, I have had the best of luck reading the original description from 1906 and the revision from 1982. 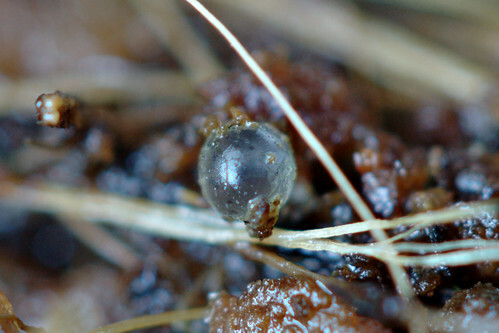 The types used for the species had a standard length of approximately 16-38 mm. Based on this and the size of the fish that I received, I would estimate standard adult sizes to be around 30 mm for a female and 40-45 mm for a male. The fish should be kept at 17-27°C (63-81°F), and ideally at 20-22°C. As with most other Apistogramma, these are omnivores that benefit from small, live foods. My pair are currently on small bloodworm, daphnia, Aquadip cichlid flakes and Aquadip cichlid granules. Both photos are of the same older juvenile/young adult female fish in stressed colours as they are not used to people yet. By December, our schedules coincided enough to get some fish for the tank. I had wanted to find some Micropoecilia branneri as we live in a hard water area, but my search failed again. Instead, I decided to try our a very popular group of fish that I had not kept before. 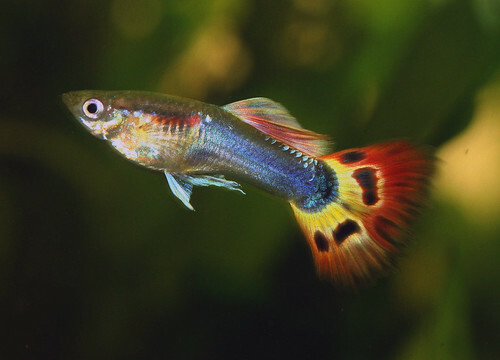 Being a complete beginner with killifish, I did my research, double and triple checking all the facts, but I failed to find guides to stocking in a “community” tank as most of the resources are aimed at breeders. On advice from some veteran killi-keepers from Seriously Fish, I found our that a 60 litre tank takes 8-12 Fundulopanchax gardeni ‘Innidere’. The interesting thing about Fundolopanchax gardeni is that it is a very diverse species with many, many natural and cultivated colour morphs. I picked ‘Innidere’ based on mikev’s recommendation and as I had never seen a F. gardeni in person, that was good enough for me. ‘Innidere’ is usually attributed as a color morph of Fundulopanchax nigerianus. In reality, Fundulopanchax nigerianus has never existed. It is true that gardeni and nigerianum used to be considered two species, but this was a long time ago, when they were both considered to be in a different genus altogether, and were merged into one species in 1992, finally being named F. gardeni and F. gardeni nigerianus in 1996. Nowadays, the correct naming is Fundulopanchax gardeni gardeni for what is traditionally considered F. gardeni and Fundulopanchax gardeni nigerianus for what is usually called F. nigerianus. When I first started looking for this species, the breeder had some juveniles available. Unfortunately, by the time that I came around to buying the fish, they only had eggs. Fortunately, I didn’t read the description properly and bought eggs thinking it was the last pair of juveniles. Hatching these fish has proven to be quite interesting and easy. So unfortunately, I did not have the promised fish for the family on the day, but (again) luckily, I had also bought a pair of Apistogramma commbrae at the same time, which I have now let them borrow. It has been eight months since I moved from Germany to UK and it is now time for another move. I have already drained the 60 litre tank, and have removed the substrate from that – all that is left now is to clean it, dry it and pack it into the box – and I am around one third of the way through removing the substrate from the discus tank. The 60 litre tank was the easy one: I drained the water into buckets, using it to water the plants, then used a measuring jug to remove the sand into a sturdy box. The discus tank is a little bit more complicated as I need to keep that running until I actually pack the fish for transportation. I have started removing the two layers of substrate separately by syphoning out the top layer of mixed sands, then fishing out the cat littler with a fish net. So far it took me about one hour to get around a quarter or the sand and litter out. Tomorrow I will try to finish it off.